A few days after accusing “global warming alarmists” like California Governor Jerry Brown (D) of ridiculing and insulting “anyone who actually looks at the real data” around climate change, newly-declared presidential candidate Ted Cruz (R-TX) upped his rhetoric against those who care about the issue. “You know it used to be it is accepted scientific wisdom the Earth is flat, and this heretic named Galileo was branded a denier,” he said. In Cruz’s opinion, when it comes to climate change, his denier position places him alongside 17th Century scientist Galileo Galilei, who was also considered to be denying the mainstream knowledge of his day. According to Cruz’s logic, he is taking the minority view that human-caused climate change is not happening, just as Galileo took the minority view that the scientific method should be trusted over the Catholic Church. Cruz mentioned in the interview that his parents were mathematicians; however he himself studied public policy before going to law school. Cruz also said he had read a 1970s Newsweek article that morning about “global cooling.” He explained how all the people who believed in global cooling suddenly switched over to global warming when the evidence on cooling didn’t line up. Either Cruz is suddenly interested in minor 1970s scientific theories or he is scrambling to find ways to push back against the overwhelming evidence that human-caused climate change is happening. Cruz is not the first to compare Galileo to those who speak out against the accepted science of climate change. In 2011, former presidential candidate and Texas governor Rick Perry dropped Galileo’s name as justification for his anti-climate position. President Obama seems to have gotten the analogy correct when he said in 2013 that “we don’t have time for a meeting of the flat-Earth society” when it comes to doing something about climate change. This is a most amusing study, showing that the earth's temperature is largely self regulating and tends toward a stable state. Since I have often noted that we in fact live in an era of great climatic stability, I like the finding. By examining how Earth cools itself back down after a period of natural warming, a study by scientists at Duke University and NASA’s Jet Propulsion Laboratory confirms that global temperature does not rise or fall chaotically in the long run. Unless pushed by outside forces, temperature should remain stable. Natural climate cycles alone are insufficient to explain such changes, he said. Brown and his colleagues published their peer-reviewed research Feb. 1 in the Journal of Climate. Using global climate models and NASA satellite observations of Earth’s energy budget from the last 15 years, the study finds that a warming Earth is able to restore its temperature equilibrium through complex and seemingly paradoxical changes in the atmosphere and the way radiative heat is transported. Scientists have long attributed this stabilization to a phenomenon known as the Planck Response, a large increase in infrared energy that Earth emits as it warms. Acting as a safety valve of sorts, this response creates a negative radiative feedback that allows more of the accumulating heat to be released into space through the top of the atmosphere. The new Duke-NASA research, however, shows it’s not as simple as that. A more detailed investigation of the satellite observations and climate models helped the researchers finally reconcile what was happening globally versus locally. “While global temperature tends to be stable due to the Planck Response, there are other important, previously less appreciated, mechanisms at work too,” said Wenhong Li, assistant professor of climate at Duke. These other mechanisms include a net release of energy over regions that are cooler during a natural, unforced warming event. And there can be a transport of energy from the tropical Pacific to continental and polar regions where the Planck Response overwhelms positive, heat-trapping local effects. “This emphasizes the importance of large-scale energy transport and atmospheric circulation changes in restoring Earth’s global temperature equilibrium after a natural, unforced warming event,” Li said. The Intergovernmental Panel on Climate Change (IPCC) has to provide proof for significant human-caused climate change; yet their climate models have never been validated and are rapidly diverging from actual observations. The real threat to humanity comes not from any (trivial) greenhouse warming but from cooling periods creating food shortages and famines. Climate change has been going on for millions of years—long before humans existed on this planet. Obviously, the causes were all of natural origin and not anthropogenic. There is no reason to think that these natural causes have suddenly stopped. For example, volcanic eruptions, various types of solar influences, and atmosphere-ocean oscillations all continue today. We cannot model these natural climate-forcings precisely and therefore cannot anticipate what they will be in the future. But let’s call this the “Null hypothesis.” Logically therefore, the burden of proof falls upon alarmists to demonstrate that this null hypothesis is not adequate to account for empirical climate data. In other words, alarmists must provide convincing observational evidence for anthropogenic climate change (ACC). They must do this by detailed comparison of the data with climate models. This is of course extremely difficult and virtually impossible since one cannot specify these natural influences precisely. We’re not aware of such detailed comparisons, only of anecdotal evidence— although we must admit that ACC is plausible; after all, CO2 is a greenhouse gas and its level has been rising mainly because of the burning of fossil fuels. Yet when we compare greenhouse models to past observations (“hindcasting”), it appears that ACC is much smaller than predicted by the models. There’s even a time interval of no significant warming (“pause” or “hiatus”) during the past 18 years or so—in spite of rapidly rising atmospheric CO2 levels. 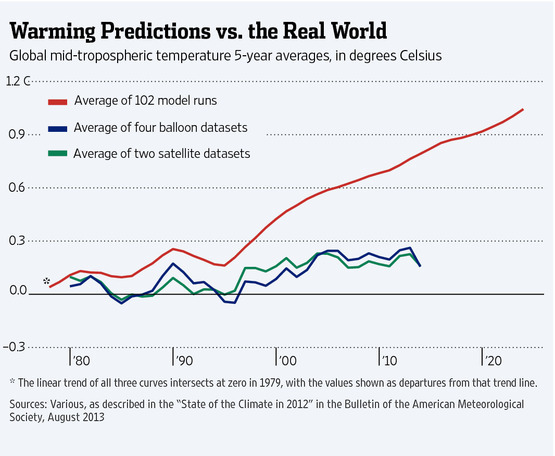 There seems to be at present no generally accepted explanation for this discrepancy between models and observations, mainly during the 21st century. The five IPCC reports [1900 to 2014] insist that there is no “gap.” Yet strangely, as this gap grows larger and larger, their claimed certainty that there is no gap becomes ever greater. Successive IPCC reports give 50%, 66%, 90%, 95%, and 99% for this certainty. Needless to say, there are no sufficient conditions to establish the existence of any significant ACC from existing data. Even necessary conditions based on empirical data, like temperature vs altitude and latitude, cloud cover, precipitation, are difficult to establish. To summarize, any major disagreement of data with models therefore disproves ACC. In other words, GH models have not been validated and may never be validated—and therefore are not policy-relevant. Anyway, any warming observed during the past century appears to be trivially small and most likely economically beneficial overall. Careful studies by leading economists and agricultural experts have established these facts [see for example NIPCC-ClimateChangeReconsidered-II – 2014]. 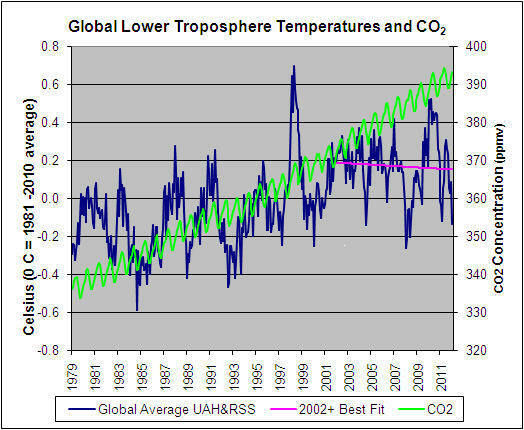 I therefore regard the absence of any significant GH warming as settled; note my emphasis on the word “significant.” Policies to limit CO2 emissions are wasting resources that could better be used for genuine societal problems like public health. They are also counter-productive since CO2 promotes plant growth and crop yields, as shown by dozens of agricultural publications. I am much more concerned by a cooling climate—as predicted by many climate scientists—with its adverse effects on ecology and severe consequences for humanity. Singer and Avery in “Unstoppable Global Warming: Every 1500 years” have described one form of observed cyclical climate change. It was first seen during the past glaciation. Loehle and Singer claim evidence for these cycles to extend into the present. In particular, historical records identify the recent cycle of a (beneficial) Medieval Warm Period (MWP) and the (destructive) Little Ice Age (LIA) with its failed harvests, starvation, disease, and mass deaths. Many solar experts predict another LIA cooling within decades. I have therefore explored ways to counter the (imminent) next cooling phase through low-cost and low- ecological-risk geo-engineering, using a specific greenhouse effect—not based on CO2. At the same time, assuming that our scheme does not work perfectly, we need to prepare for adaptation to a colder climate, with special attention to supply of food and sustainable water and energy. The outlook for such adaptation appears promising—provided there is adequate preparation. However, the coming cold period will test the survivability of our technological civilization. Instead, Tesla survives on government handouts. In 2015, Tesla delivered 50,580 cars worldwide, with 25,700 going to U.S. customers. This is a trivial percentage of both the worldwide and U.S. auto markets. A record 17.5 million passenger vehicles were bought in the United States in 2015. Yet only 0.67 percent—or 116,548 vehicles—were all-electrics or plug-in hybrids, 6,500 fewer than in 2014. EVs account for 0.16 percent of the 250 million U.S. passenger vehicles on the road. The market for electric cars is trivial, despite massive government support. ZEV credits are a mandate dreamed up by the bureaucrats at the California Air Resources Board (CARB), which requires [auto] manufacturers to build and dealers to sell an arbitrary number of “zero-emission” vehicles each year. . . . Tesla’s Model S generates four credits per unit sold. This means the company can sell $20,000 in ZEV credits to other [auto] manufacturers for each Model S sold—a cost borne by purchasers of other cars. ZEV credits, pioneered in California, have spread to nine other states. Tesla has collected more than $517 million from competing automakers by selling ZEV credits to those who fail to sell enough zero-emissions cars to meet arbitrary mandates. Charles Lane of the Washington Post said: “Tesla owes its survival to subsidies from taxpayers, who are usually less well-heeled than its plutocratic customers.” The average household income of Tesla owners is $320,000, according to Strategic Visions, a consumer research company. Tesla buyers have also raked in $38 million in California government rebates (they receive a $2,500 rebate for each Tesla bought) and $284 million in federal tax incentives (they receive a $7,500 federal tax credit for each purchased Tesla). The Los Angeles Times calculated that Elon Musk’s three companies, Tesla Motors, SolarCity, and SpaceX, combined have received a staggering $4.9 billion in government support over the past decade. As Kerpen noted: “Every time a Tesla is sold . . . average Americans are on the hook for at least $30,000 in federal and state subsidies” that go to wealthy Tesla owners. This is crony capitalism at its worst. Hold onto your wallets everyone, Tesla wants to grow. “Let’s create millions of jobs,” Clinton said. “And I’ve set two big goals. Clinton, who was introduced by her husband, former president Bill Clinton, and her daughter, Chelsea, said the Republicans who don’t accept climate change should talk to scientists and science teachers at the high school where the rally was held. “Come to this high school and talk to science teachers and you will understand what climate change is,” said Clinton, noting that one third of electricity in Iowa in generated by “renewable” energy sources, mostly wind. According to the Energy Information Administration, renewable energy sources provided about 11 percent of electricity generation in the United States in 2014, with 81 percent of energy production coming from oil, natural gas and coal. A new poll has surfaced showing once again the vast majority of Americans don’t rank global warming as the most serious issue facing the country. A YouGov poll of 18,000 people in 17 countries found only 9.2 percent of Americans rank global warming as their biggest concern. Only Saudi Arabians were less concerned about global warming at 5.7 percent. The biggest concern for Americans was global terrorism — 28 percent of Americans polled listed this as their top issue. Despite a big PR push by President Barack Obama to tout his administration’s global warming agenda, most Americans have been unconvinced it’s the country’s most pressing issue. A Fox News poll from November found only 3 percent of Americans list global warming as their top concern. The Fox poll came out just before Obama met other world leaders in Paris to kick off another round of negotiations for an international treaty to cut carbon dioxide emissions. After weeks of haggling, United Nations delegates agreed to non-binding emissions cuts. Then, government scientists declared 2015 the warmest year on record. This news only emboldened politicians and environmental activists who want to build public support for more regulations on fossil fuels. “In Paris, the entire world acted as one by agreeing to a universal climate accord that set an expiration date on fossil fuels–but now we must pick up the pace,” Michael Brune, executive director of the Sierra Club, said in a statement. But Brune’s insistence that Republican lawmakers and corporations are responsible for keeping the American public ignorant of the dangers of global warming doesn’t seem to be backed up by the polling data. Polls have consistently shown global warming never ranks high on the American public’s radar. A CNN poll from January 2015 found that 57 percent of Americans did not expect global warming to threaten their way of life. “Meanwhile, only 50 percent of Americans believe global warming is caused by man-made emissions, while 23 percent say it’s caused by natural changes and 26 percent say it isn’t a proven fact,” CNN reported. “Importantly, even as global warming has received greater attention as an environmental problem from politicians and the media in recent years, Americans’ worry about it is no higher now than when Gallup first asked about it in 1989,” Gallup’s Jeffrey Jones wrote.